A ship's cook was crushed to death when a hatch cover fell on top of him, an investigation found. Able seafarer Alfred Ismaili, 36, an Albanian national, died on the SMN Explorer at King's Lynn on 1 February while helping to load cargo slings. Locking pins had been removed from the heavy hatch, which fell on to him as he climbed up it. A Marine Accident Investigation Branch report criticised the "safety culture" and lack of supervision on the vessel. The ship, which sails under the Liberia flag and was on charter to Scotline, arrived with its cargo of timber at Alexandra Dock in Norfolk on 31 January. The following day, after the crew had finished unloading, Mr Ismaili announced lunch was ready, however, the decision was taken to finish stowing the cargo slings before eating. Mr Ismaili stayed on deck to help so that lunch would not get cold. As he climbed the hatch cover to grab some slings, it then fell on him, trapping him. Crew members were unable to lift the nearly one-tonne hatch and had to call a crane driver to assist. He was given first aid, but paramedics, who arrived shortly afterwards confirmed him dead at the scene. Post-mortem tests concluded he died from a severe blunt force injury to the chest. The MAIB investigation into the accident said the cause was an "improper attempt to save time and avoid discomfort" in conjunction with "improper performance (the removal of the locking pins before the crane hook had been attached)". Mr Ismaili also had a blood alcohol level of 75mg per 100ml which was 50% higher than the limit set for seafarers, which "could have affected Alfred's judgement", the report said. 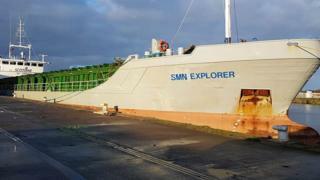 The MAIB said the "safety culture on board SMN Explorer was weak" and "inadequate procedures" were in place for using the hatch. Since Mr Ismaili's death, Sky Mare Navigation, the Explorer's management company, has addressed the procedural issues and provided further crew training, the report said. MAIB has recommended the company takes action to improve the management and maintenance of its lifting systems and takes further action to improve the "safety culture" on all its vessels.